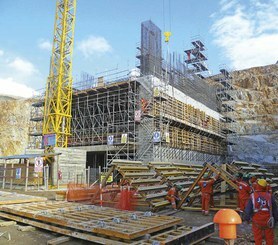 In Peru, where mining constitutes 14% of the GDP, Toromocho Mine has become one of the most productive in the country. Situated at 4500 m above sea level, it is expected to supply 1.5 billion tonnes of mineral material. ULMA supplied a comprehensive formwork and scaffolding system to construct the infrastructure, processing facilities, crushers, access tunnels, material extraction tunnels, and more. 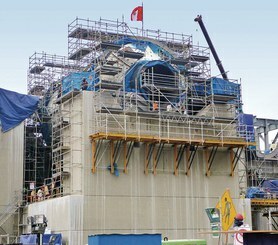 Standing at more than 25 m tall, the crusher facilities are representative of the project as a whole. 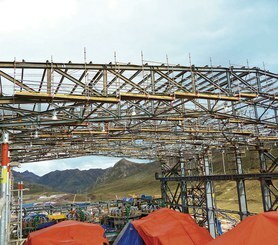 A cantilevered structure 3.7 m long and 1.1 m thick was built using 20 MK trusses. 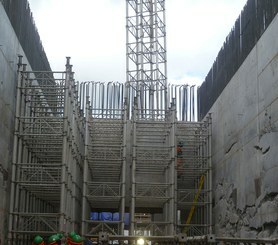 Using this as a base, it was possible to complete the top floor with a height of 9 m.
ORMA formwork was used for the vertical structures, 1.5 m thick walls with uniform dimensions, which greatly reduced the time between pours.